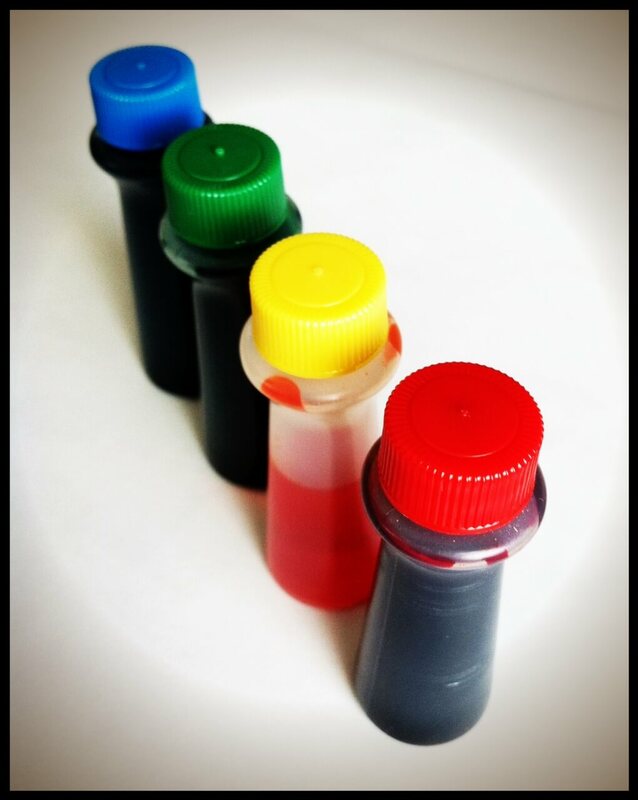 Artificial food dye, synthetic food dye, food coloring, FD&C Red No. 40, FD&C Blue No. 1, or Tartrazine (a.k.a. Yellow No. 5)… whatever name it’s listed under, it is all pretty much the same stuff. And as I’ve said on this site before I have no problem occasionally digging into yummy homemade baked goods made with plenty of chocolate, sugar, or whatever else we’re craving, but what I NEVER want to “treat” myself (or my children) to is a dose of chemicals derived from petroleum. Yep, no typos there…that’s what artificial food dye is made from (it used to be derived from coal tar – so we haven’t improved much!) and unfortunately the 15 million pounds of food dye used in the U.S. per year (5 times more than in 1955) is in much more than just colorful icing these days. Dyes, made from the same petroleum that fuels our vehicles, is turning up in an insane amount of packaged foods including Kraft Macaroni and Cheese, Minute Maid Lemonade, Lunchables, Fruit Roll Ups, Cheetos, and even “Light and Fit” Yoplait Yogurt. And the crazy thing is these food manufacturers tell us right there on the ingredient label that artificial food colorings (and sometimes “artificial flavoring”) have been added…but most consumers don’t seem to be fazed by it. Upon discovering what this (seemingly harmless and common) additive is made from I had to tell my daughters. I explained how it’s in thousands of products including birthday party cupcakes, salad dressing, cough syrup, and even daddy’s mouthwash. Rightfully so my 1st grader looked at me a little shocked and went on to say, “Can we write a letter to the president?” Now I love how that girl thinks, but at the same time it broke my heart that my innocent child thought that’s all it would take. If we just told the president that food manufacturers were feeding us petroleum based chemicals disguised as brightly colored food dyes he surely wouldn’t allow it anymore. And while I am not very good at politics myself what I’d like to be good at is educating and influencing all of you to vote with your dollars. I truly believe that if consumers stop purchasing artificially dyed and flavored foods we can make an impact. If enough of us speak up the big food companies will listen to consumer demand. And I know this for a fact because that’s exactly what’s happened in other countries outside of the U.S (check out #3 below).…we are apparently just behind the curve on this one. 1. They are made in a lab with chemicals derived from petroleum, a crude oil product, which also happens to be used in gasoline, diesel fuel, asphalt, and tar. 2. They’ve been linked to long-term health problems such as cancer. If you’re a child of the ‘80s (like me) do you remember that rumor about red M&Ms causing cancer? Maybe it wasn’t just a rumor after all. CSPInet.org: “The three most widely used dyes, Red 40, Yellow 5, and Yellow 6, are contaminated with known carcinogens, says CSPI. Another dye, Red 3, has been acknowledged for years by the Food and Drug Administration to be a carcinogen, yet is still in the food supply.” FYI – According to Wikipedia, “A carcinogen is any substance … that is an agent directly involved in causing cancer.” !!! 3. Did you know that food products containing artificial dye are required to have a warning label in the U.K.? The label states that the food “may have an adverse effect on activity and attention in children.” So speaking of M&Ms, they aren’t so brightly colored in some countries outside of the U.S. because manufacturers would rather do away with the artificial dye than have to put a warning label on their products. 4. Synthetic food dyes have been shown to cause an increase in hyperactivity in children as well as a negative impact on their ability to learn. 5. They add absolutely no value to the foods we are eating, but do in-fact pose quite a few serious risks. 6. They trick your senses…just like other artificial additives including sweeteners. 7. They are contributing to the obesity epidemic by attracting children (and adults) to highly processed food, which in many cases is being eaten instead of fresh whole foods. Disclosure: My children do occasionally eat foods containing artificial dye because it’s provided to them by teachers, other parents, and friends, but it’s not something we spend our own money on anymore. Does anyone know…does medical allergy testing for food allergies include testing for reactions for artificial dyes, chemicals, etc.? My son has ADHD. I do a lot of homemade cooking so he gets a lot fewer artificial ingredients than a typical diet, but he still gets his share. It would be a hard-sell in my home to do an elimination diet test, so if there is a way to medically-diagnose food sensitivities or allergies like this, it would make it a lot easier. Thanks! There is no scientific link between Yellow #5, Yellow #6, and cancer (most of the dyes that do have already been phased out), nor is there a scientifically proven link between them (or for that matter, ANY artificial dye) and ADHD. Yellow #5 can trigger allergic reactions in people who are also allergic to aspirin, but Yellow #6 has no known adverse side effects. I highly recommend actually looking up the chemicals themselves and not listening to people spouting claims without a sound scientific basis. A great place to learn on dyes! Medical allergy testing does test for dyes because I had the allergy test when I was young… in the early 80’s… and I am allergic to yellow dye #5 (tartrazine). Hi – Thought I’d share our new natural food colors with you. www. colorkitchenfoods.com. Thank you for the article. I hope we can be apart of your real food journey. There is a lot of misinformation here. This thought that Petroleum is something horrible is ridiculous. It is literally the earth’s carbon reservoir. The silliness that someone is says “Oh no, Petroleum is the source of this chemical and therefore it is bad”…amazing. Just because it is slimy and ugly initially, makes it a target as something awful, when it is one of the most useful chemical supplies currently available. The plastic that is probably holding your sandwich came from it as well. This is akin to saying that since certain poppy seeds give us heroin, we shouldn’t consider it for other uses. There is a considerable amount of carcinogen misinformation as well, but I’ll let others address that.